A great night out starts with a good cocktail and now the same can be said for business thanks to this unique infographic designed by The Website Group. It showcases some incredibly useful business tools, all in the form of a few… Cocktails? All will be revealed. Keeping your finances in order can be a laborious job, but not with a little ‘Checks On The Beach’. Breeze through those tedious tasks with ease using some of the carefully selected tools that form part of the first cocktail on the infographic. If you love being in the spotlight, and which business doesn't, then the ‘Attention Seeker’ cocktail will help to gain you the visibility that you so crave. This one includes some of the best marketing tools around. If you prefer relaxing by the pool with friends at dusk - then you'll love ‘Social Sunset’. Made perfect by its combination of some of the very best tools to keep you on top of the social game. Finally, if shots are more your thing then you can enjoy a few shots of inspiration along the way too! 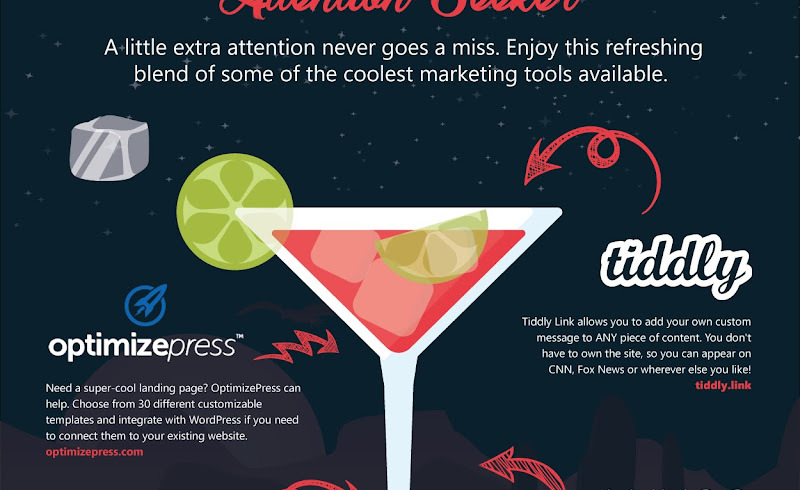 So kick back, put your feet up and sip your way to success with this cool infographic titled “A cocktail of incredible tools for business”.